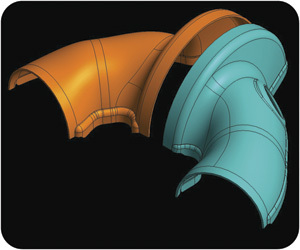 Dilast developed transfer tools to stamp this stainless-steel exhaust assembly, making use of the new Target Driven Deformation feature within Visi die-design software. TDD allowed the firm to quickly overcome formability issues so that within a few hours it could submit the new geometry back to the customer for air-flow testing. Designing the assembly, which required a maximum weld gap of 0.5 mm, Dilast input part geometry from CMM results out of the tooling and reverse-engineered new geometry using the TDD feature to alter form steels. In that light, consider Tier Two design house Dilast Tool & Die Ltd., in Cambridge, Ontario, Canada, which feeds a steady diet of tooling to the region’s automotive suppliers. The lethal combination of increased stamped-part complexity and shrinking lead times has Dilast president and part owner Gerald Claus searching for antidotes. Lead times for new projects are as short as 14 weeks, Claus says, down from 24 weeks just a few years ago. Also, customers often look for early-hit parts from hard tooling and laser trimmed in as little as 7 weeks. Meanwhile, part tolerances that once averaged ±0.040 in. have shrunk to as tight as 0.010 in., particularly for parts assembled via robotic welding. The Dilast 15,000-sq.-ft. die-design and build shop employs 18, including three designers. While it can handle tooling to 180 in. long, the firm’s sweet spot is progressive and transfer tooling 72 to 144 in. long. “We’re 60 percent progressive, 40 percent transfer,” Claus says, noting a significant increase in the amount of transfer dies coming his . This is due to increasing part complexity as well as the desire of stampers to conserve material. Dilast has carved a nice niche in the automotive supply chain as a specialist in tooling up metalformers to stamp stainless-steel exhaust components. This niche represents about half of the firm’s book of business. 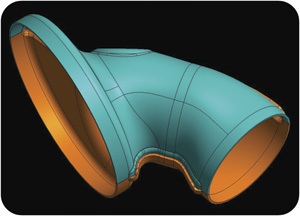 It’s number-two market: complex bracketry for seating assemblies. The design program of choice at Dilast: Visi Progress, from Vero. Among the new features of which Claus speaks is target-driven deformation (TDD), introduced by Vero with Visi Progress V18. Dilast began using Visi in 2003, with V11; it recently reviewed the latest version, V19.